‘Tis the season for school lunches! To be honest, I love sending my kids to school with hand-packed lunches. Granted my husband is usually the one to whip them up most of the time, but I think it is such a great way to let our girls know we’re thinking of them throughout the day, even when they’re away—it’s a little touch of home and comfort, and it is also good to know you are nourishing their growing bodies with good food you actually want them to eat! 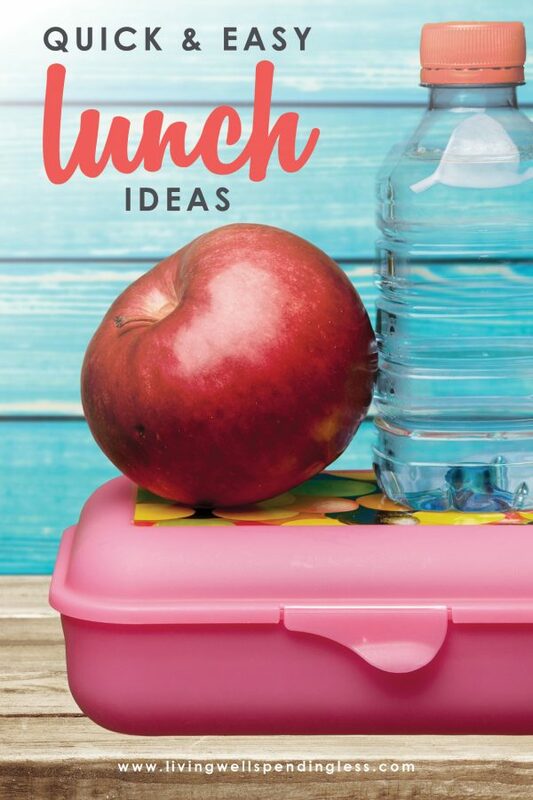 While it can sometimes feel a little time consuming to prepare lunches (especially if you wait until the morning rush), with some organization and smart strategies you can keep your kids happy, nourished and ready-to-learn, without stressing yourself out. Get a jump start on your week by prepping on the weekend! Your family’s breakfasts, lunches, and dinners will be a breeze all week. GET MY PREP PLANS NOW! And let’s be realistic, too–hot lunch gets expensive fast! School lunches can run from $2-$4 per day—so with two or three kids, you can easily spend hundreds a month. The good news is many schools have overhauled their school lunch nutrition, so the choices are healthier these days. Even so, between food aversions, allergies, and worrying about what your kids will really eat when you aren’t there, a DIY approach gives us as parents just a little more peace of mind. Luckily for you, the team here at RSO has worked up a few strategies and techniques to ensure all our kids have happy, healthy and delicious lunches every day–they might just help you too! Sunday prep work frees up the rest of your week, so you can take care of all those things that come up weekday mornings. Do I love spending Sunday afternoons in the kitchen? No, not always, but I do love seeing a freezer full of meals and a refrigerator full of lunches and snacks that are all prepped and ready to go. If you do Sunday prep, pick items that store well. If you make sandwiches, wet fillings can get pretty soggy and not-so-yummy by the end of the week. You can, however, add the dry fillings (meat, cheese, lettuce) ahead of time or prepare fillings (like hummus, roasted vegetables or tuna) ahead of time, so it’s just a matter of scooping it on bread or adding a squirt of mustard and mayo right beforehand. Sunday prep is a great time to get chopping out of the way—carrot sticks, celery, peppers and broccoli can all be cut up once and last all week. Scoop sauces like ranch, salsa or hummus into small containers so they’re prepped to grab and go. Bag individual servings of chips, pretzels, dried fruit and other munchies in containers or baggies to make for easy access (and to save money on individually packaged items which can be convenient, but a real budget-killer). Get your kids on board with Sunday Prep. Most school-aged kids love to help out with bagging items and even some of the chopping. It’s a great way for your kids to learn their way around the kitchen, helps you get more done, and it gives them a great sense of responsibility. It teaches your children how to make choices and gives them autonomy when they get to help select their lunches. This sense of ownership will work in your favor when you realize there will be much less waste. When kids choose their own food, they tend to be more excited about eating it! One major success strategy is to prepare your menu ahead of time. Have your shopping list planned out and stick to it. Then, select from a few mix-and-match items to turn it into a full menu. If you want to have roast chicken one evening, plan to shred part of it for sandwich filling the next day. If you find a great deal on peppers, roast some to-go in wraps and serve the others raw with a dip. If you open a can of chickpeas or a jar of salsa, work some of it in as a salad topping for you and send some pureed with chips or crackers with the kids. I don’t know about your kids, but mine LOVE finger foods! Cutting sandwiches into bite-sized “lunchables” or sending a stack of pretzel chips with soy butter (our school is nut-free) floats their boat and means lunch bags come back empty! To make dip less of a challenge to send, use a jar and put the dip in the bottom with veggies on top OR recycle applesauce and pudding cups to hold dip and keep the contents of the jar from becoming soggy. When you’re trying to think of fun finger foods, there’s no reason to go out and buy items cut into little pieces—just DIY. Grapes, cheese, ham, turkey, cold chicken, tofu, and citrus fruits make great bites. Cut cucumbers and carrots into sticks or coins, or try a spiral cutter to get veggies into edible curls and noodles. These cutters work like a pencil sharpener and create fun shapes from zucchini, carrots, sweet potatoes and other veggies, all great substitutes for noodles, which don’t hold up as well to sauces and travel. Try a fun “breakfast dippers” theme, with dipable pancake wedges, French toast sticks, or bananas and jam or a little maple syrup. To avoid a sticky mess, whip your maple syrup into butter, light cream cheese, or a nut butter. Cold pizza sticks, garlic bread, or cold mozzarella sticks can be fun with some marinara dip. Try teriyaki with tofu, or chicken or strips of pork and green beans, carrots or snow peas. Most schools don’t have access to heating sources at lunch. In the winter, it can be nice to have a thermos to send hot soup or chili with your kids, but I find it can be a bit messy (a leaking thermos in a backpack is a real nightmare) and hard for younger kids to pour out warm soup and eat. It also doesn’t always stay as warm as you’d ideally like. On the flipside, most school lunches remain at room temperature during the morning before lunch. Make a DIY ice pack by freezing a damp sponge in a Ziploc baggy and placing it in your child’s lunchbox or bag. I generally avoid sensitive items like yogurt, cottage cheese and milk products, because my kids just don’t like them if they aren’t ice cold. Hard cheese and string cheeses, as well as most sandwich fillings hold up just fine in a bag with the ice pack. When you think of sauces, you may want to avoid mayonnaise-based sauces and dips, and instead go for things made with sour cream or soy, which tend to be less temperature-sensitive. Hummus is a great filler and sauce, and salsa can stand up to regular temperatures as well. Mustards, ketchups, soy and oils can all be packed without much worry about temperature sensitivity. Ensure your mornings go smoothly by storing lunch items together. If you have a low drawer or pantry shelf, it can make a great lunch prep and storage area. 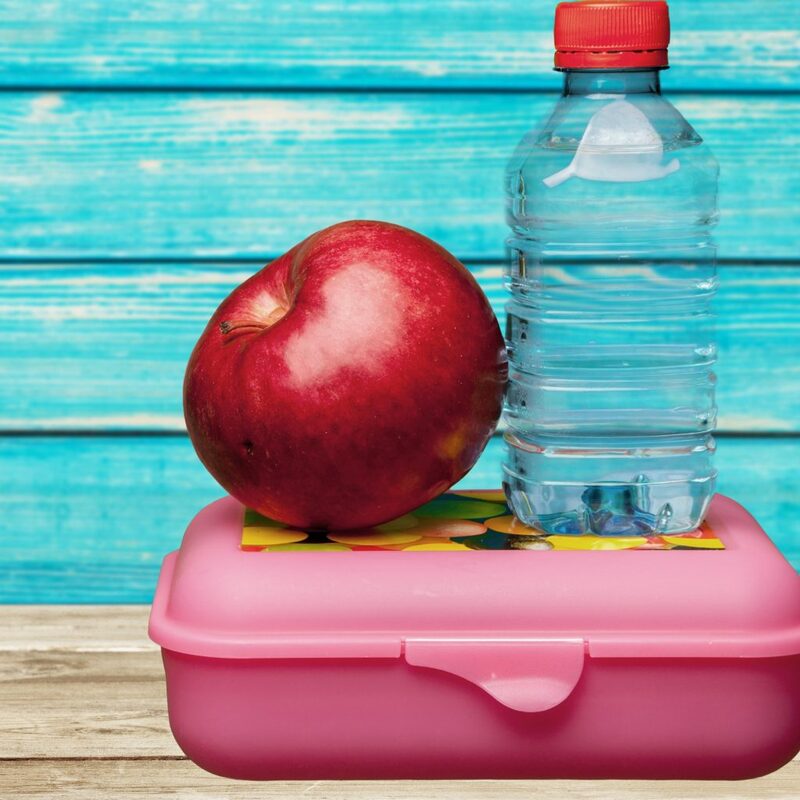 You or your kids can simply go to the drawer or shelf, fill their lunchbox with a few items, and then go to a set shelf in the fridge to grab the cold items. Bins make great sorters to keep your fridge shelves clear of clutter and keep lunch items cold and on-hand. 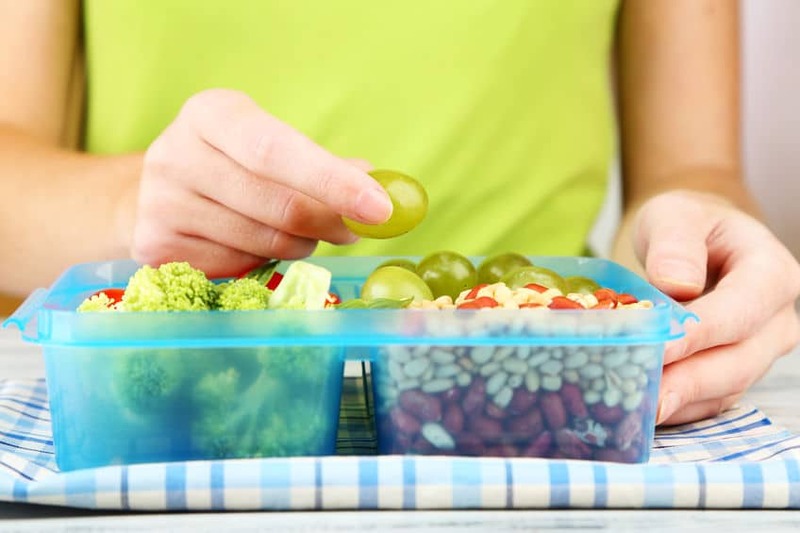 If you really struggle with your morning routine, you may even want to put everything in containers and into your kid’s lunchbox the night before, then store it in the refrigerator so they can grab-and-go in the morning. Keep apple slices from browning by sprinkling them with a little lemon juice or wrapping a rubber band around the apple after it’s cut. Use lettuce as a barrier between sauces and bread to keep things from getting soggy. We also keep a shelf in our pantry that houses “big bags” of lunch items. These chips, cookies, crackers and dried fruits are relatively off-limits for other times (like afterschool snacks). When I need to do my Sunday prep, I simply pull down the big bags and use them to fill lunch containers. Plus, I can tell at-a-glance if I have everything I need on hand. 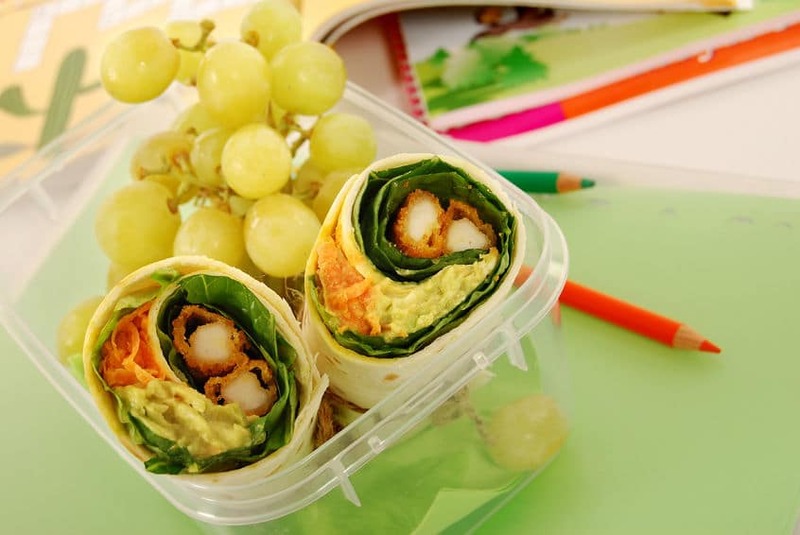 If your kids tire of the same ol’ sandwich routine, try thinking of sandwich alternatives—wraps are a great way to mix things up. You can also create “sushi” rolls out of tortillas with meats, cheeses and fillings. Cut them into bite-sized pieces to quickly enjoy. Quesadillas are great alternatives to cheese sandwiches, and cold, they make great dippers for salsa and sour cream. Soy butters or sunflower seed butter works just as well as the old peanut standby—pair with jelly, jam or fruit slices, then cut into bite-sized morsels. Lettuce can also make for a great wrap container. Use big leaves of romaine, red or Boston lettuce to hold yummy fillings. Leftover rice and stir fry in a lettuce wrap, secured with a toothpick is delicious and exotic (without being too “out there”). Try flavored tofu or chicken with buffalo or barbecue sauce in a wrap or lettuce wrapper. I find most kids aren’t fans of salad, but a lettuce roll with a ranch or teriyaki dip is awesome. I don’t like to include too many sweets in my kids’ lunches, but fruit, jam (or a little butter, cinnamon and sugar) rolled in a whole wheat tortilla can be a great treat—and it’s a little more sustaining than those Little Debbie and Hostess sugarbombs. You can make peanut butter and jelly “uncrustables” ahead of time and pop them in the freezer for convenience. If your school is nut-free, you can do the exact same thing with peanut alternatives like soy and sunflower butters. You can also try freezing hummus sandwiches with savory fillings like roasted red peppers. Make a few weeks’ worth ahead of time or go through a loaf of bread. Pop the sandwiches in bags, then bag them all in a freezer bag. Remove each sandwich from the freezer a day ahead and let it thaw in the fridge for a few hours. You can even take them out of the freezer during your Sunday Prep and have them ready to go for the week ahead. When it comes to lunch prep (and meal prep in general), one way to save money on your grocery bill is to opt for vegetarian lunches when possible. Lunchmeat tends to be high in sodium, preservatives and other stuff you’d probably rather not have in your kid’s meals. Instead of lunchmeat, look for alternatives. Chickpeas, white beans, black beans, seed butters and cheeses all make for great fillings with less expense and concern. Light cream cheese can be a great sandwich spread and it holds up very well between morning and lunch. Add jam or jelly to create a “bagel wrap” or cream cheese “tea sandwich” with cucumber (if your kids like fancy-sounding lunches like mine do). Pickles and pickled veggies like dilly beans can get kids enthused about eating green. Watch for items with less sodium or can your own. Sliced tomatoes might get a little soggy, but over-roasted tomatoes hold up well into the lunch hour. Quinoa is high in protein and has a mild flavor that kids can really get into. Try it with some vegetables and sauce mixed in. Whole-wheat pasta salads (made with oil instead of mayonnaise) and a little balsamic vinegar or mustard can be easy to transport and eat. Just be sure to include a fork or spork so your kids can dig into their yummy veggie bowls. I find the key to a great lunch is to find the balance between something familiar and something fun or exotic. My kids love feeling like they’ve got a special treat to take for their meal. It doesn’t have to be complicated or expensive. Ants on a log (celery sticks with cream cheese and raisins) or crudités (chopped up veggies) or a lunch of appetizers (bite-sized morsels) can be super exciting and enjoyable. Kids gravitate toward the familiar and sometimes they don’t like certain fruits or veggies. Let them have a voice in what they’re taking for lunch and listen to their likes and dislikes. If they want turkey and cheese, a bag of chips and an apple each day, then, well? Let them go for it. Forcing your kids to take a quinoa salad or lettuce wrap might just result in wasted food and money. On the other hand, encourage your kids to try new things and give you feedback on what they like and dislike. Edamame or snap peas can be much more exciting than regular old beans. Try incorporating leftovers from dinner as sandwich fillings or toppings for salads and grain bowls. When it comes to packing lunches, there can be a LOT of waste involved—paper bags, plastic sandwich bags, disposable containers for applesauce, yogurt tubes and little bags with trail mix and other treats—it all goes in the garbage (and costs extra to boot)! Instead of using items that will just end up in the garbage, try to find containers that can be reused over and over. Lunch pails and bags are often insulated and safer for your child’s food anyway. Many of them can be found on sale during back-to-school time, and check your local Goodwill as well. For small food containers, look for BPA-free plastic, metal or glass. I like metal containers because they’re long-lasting and there’s no concern about breaking or shattering. Glass mason jars can make great containers for snacks and salads as well. Consider purchasing a yard of inexpensive heavy-fabric like denim or heavy cotton, and sewing a few snap-and-go containers to hold dry snacks like chips, crackers and cookies. These little bags can be simply tossed in the washer and reused over and over again. You can also find food-safe plastic coated fabrics like PUL (used in plastic pants for cloth diapers) and sew small bags to hold food with more moisture. Another great solution? Take a clue from your local deli and wrap sandwiches in waxed paper or parchment. 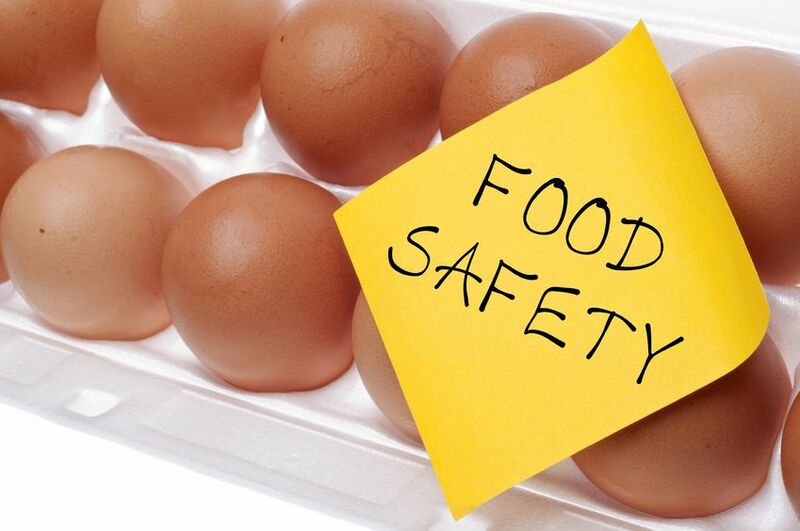 Kids can simply toss out the paper after they eat and it’s much more environmentally friendly. Try to minimize waste in your school lunches as much as possible. 10. Personalize to Show You Care! One of the best ways to make a lunch feel special is to include a little note or message to your kids. Some parents draw on lunch bags, cut sandwiches into shapes with a cookie cutter, or spend time making intricate Bento-style lunches. While those things might take up a little more time than your schedule allows, it just takes a minute to show you care. Add a sticker to your child’s lunch bag or use it to seal the paper around their sandwich. Keep stickers handy in the drawer where you keep lunch supplies, along with a marker to label the bags with your kids’ names and the contents of their lunch. Find printable quotes or messages and prepare a sheet or two so you can drop in a little thought each day. Another idea to keep your kids smiling? Sending them off with a little printable joke or silly saying in their lunch bag. Think of the joy you experience reading a Laffy Taffy or fortune cookie—it’s the same concept. A little message from mom can make a hard day go that much easier. Use these quick and easy (and cheap!) 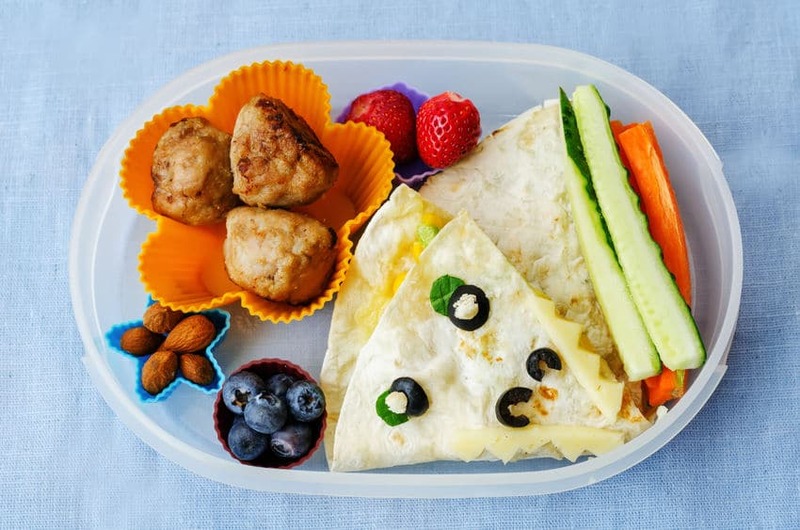 lunch ideas to help streamline your kids’ school lunches. With a little Sunday prep, clever organization and storage, and creative thinking, you’ll spend less time on lunches—plus, you’ll enjoy more stress-free mornings. So try these school lunch tips and tricks anytime. 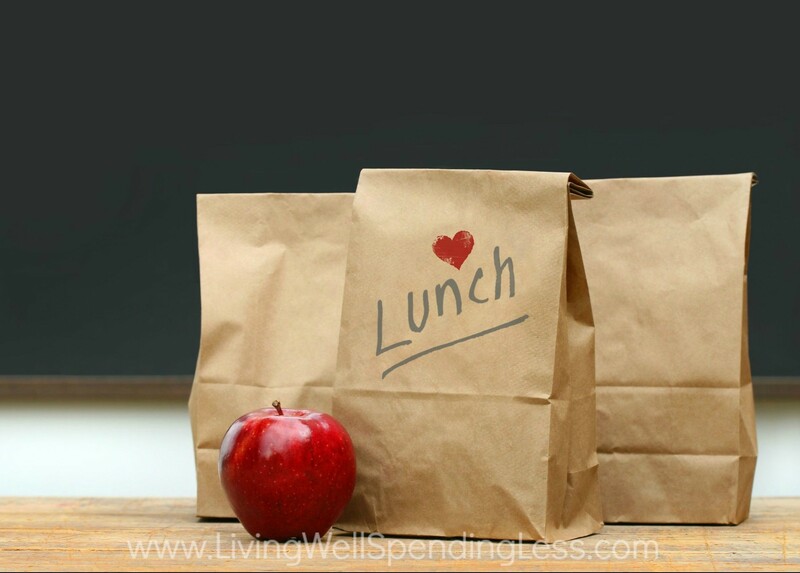 It’s never too late to make school lunch easier on your schedule (and your wallet)! With a little planning and a few good ideas, you can rock lunches and brighten your child’s day, which gives every parent peace of mind! Great ideas. I also mason jar meals. They’re so easy and convenient. I meant to say, I love* mason jar meals.